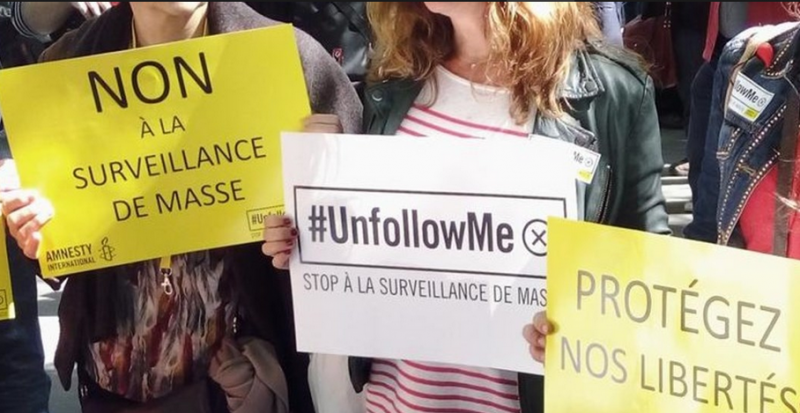 Anti-surveillance demonstration in France. Photo via Amnesty International. …the Constitutional Council struck down one of the articles of the government bill defining international surveillance. Why? Mainly because the bill included a provision about the terms and conditions of exploiting, keeping and deleting the collected information in the form of a decree. A perfect case of reverse incompetence [according to the French Constitution, the subject pertains to Parliament only]. After a long period of vacillation, last week the government announced the surprise deposition of a bill designed to fill the gap […] thus avoiding passing legislation which would have made it necessary to undertake an impact assessment. The latter is a potentially troublesome step which would have involved revealing, in particular, details of the cost of these measures. The articles are in fact more much involved than the part struck down by the Constitutional Council. This is hardly surprising, as the government had to replace the provisions they had previously attempted to pass by secret decree. For a detailed review of the provisions of this additional bill on international surveillance, read the comprehensive report published by French magazine l'Obs on September 9. On the legal front, action is also being taken before the French courts, under a coordinated effort by European Digital Rights (EDRI, a Brussels-based group. Mobilization around the bill is picking up speed, albeit on the late side.